A sharp pointed probe used to investigate natural or restored tooth surfaces to detect caries or other defects. 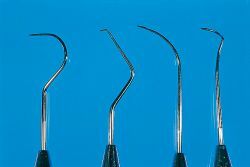 A sharp pointed dental instrument used to investigate natural or restored tooth surfaces to detect caries, other defects, or dental deposits (e.g., calculus). A sharp pointed instrument used to investigate natural or restored tooth surfaces to detect caries or other defects. Types include ODU 11/12 (to detect calculus) and 23 (to detect caries). n a dental instrument with a slender head that is honed to a fine point, used to conduct a tactile examination and appraisal of pits and fissures, carious lesions, root surfaces, and margins of restoration. n a type with a paired working end and long lower shank whose specially angled tip design makes it suited for use in either shallow depressions or deep pockets. n a type used to examine proximal tooth surfaces for calculus and caries, which, because of its arc, allows easier access to back teeth. n.pr a type that is used to detect calculus, caries, lesions, and cemental changes on the subgingival surfaces of a tooth. n See explorer, Orban No. 20.
n a hand-activated assessment tool, so named because of the distinctive shape of its shank, that is used to examine fissures and the surfaces of natural teeth, restorations, and sealants; not suited for exploration inferior to the gingival margin. n a type with an unpaired working end and short lower shank that is used to examine caries inferior to the gingival margin and in restorations with irregular margins; not suited to detecting calculus inferior to the gingival margin. n.pr a type that is used to detect calculus, caries, lesions, and cemental changes on the subgingival surfaces of a tooth; may be adapted for use on selected supragingival surfaces. n.pl two identical explorers with contralateral curves that are used to examine opposite tooth surfaces superior to the gingival margin; mirrored-image explorers.